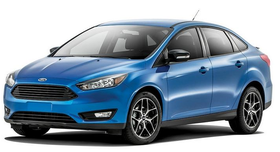 The Ford Focus is among the cars slated to end U.S. production. DETROIT — General Motors Co. will be the only one of the Detroit 3 making compact or midsize cars in the U.S. by 2019, according to the companies' new agreements with the United Auto Workers (UAW) union. Ford Motor Co. and Fiat Chrysler Automobiles (FCA) are essentially giving up on trying to build mass-market cars profitably in the U.S., instead shifting most production of those nameplates to Mexico so they can dedicate U.S. plants to higher-margin pickups and SUVs. The UAW is accepting that trade-off to get rid of the two-tier wage scale that was vital to the business case for U.S.-made sedans and because it expects a net increase in jobs. The result: In a few years it will be far easier to find a Japanese or Korean car produced domestically than one designed in Detroit that's not imported. Foreign brands are expected to keep their U.S. plans churning out high-volume cars, such as the Toyota Camry and Honda Accord. But, increasingly, Ford and FCA see the U.S. as a place to build light trucks. The Ford and GM agreements had not been ratified by UAW members as of press time. Ford's product comments to the UAW show that it plans to halt U.S. production of four car nameplates: the Fusion, Focus, Taurus and C-Max. The Focus and C-Max are moving out of Ford's Michigan Assembly Plant in 2018 to make way for two vehicles that sources have identified as the Ranger pickup and Bronco SUV. The Fusion is built in Mexico already, while the Taurus, with sales plummeting here but surging in China, may be discontinued in North America. Ford's factory in Flat Rock, Mich., will be the only one of its eight U.S. assembly plants still making cars. It loses the Fusion when the next generation arrives in 2019, keeps the hot-selling, higher-profit Mustang and gains the Lincoln Continental, another high-margin nameplate, which will replace the MKS. Meanwhile, FCA is expected to move the Dodge Dart and Chrysler 200 to Mexico after 2016 and will discontinue the Dodge Viper in 2017, which would leave no cars in the U.S. The Dart is leaving just four years after its launch in the U.S. allowed Fiat to gain an additional 5 percent stake in Chrysler under a deal with the federal government. The cars that Ford and FCA are moving out of the U.S. and the Buick Verano, which GM is expected to move to either Mexico or China, account for 45 percent of the domestic-brand car production in the U.S. for the first 10 months of this year, according to Automotive News Data Center estimates. GM hasn't announced any sweeping changes in where it will assemble its cars. It makes most of its sedans in the U.S., including the Chevy Sonic at a plant in Michigan that reopened specifically because the UAW agreed to cut costs there with two-tier wages. CEO Mary Barra said in July that GM had no plans to move production of the Sonic, which it also builds in Mexico. GM spends an estimated $674 more on labor costs for each Sonic built in the U.S. than Ford does for the Fiesta built in Mexico, according to the Center for Automotive Research. In August FCA CEO Sergio Marchionne told Automotive News, a sister publication of Tire Business, that it makes financial sense to move “all the cars that we get killed on somewhere else” and keep trucks in higher-cost UAW plants. UAW President Dennis Williams went into this year's contract talks noting that he was concerned “when any corporation invests outside the United States,” but negotiators and workers seemed far more concerned with wages and benefits than discouraging production shifts to Mexico. The union's deals include billions of dollars worth of investment in U.S. plants, and moving cars to other countries isn't expected to result in job losses — so long as consumers buy enough SUVs and pickups to keep the plants here running at capacity. The plans undo most of the product diversification that the Detroit auto makers had worked toward in the late 2000s to avoid the problems that occurred when SUV sales plunged after gasoline prices shot up. The danger in focusing U.S. plants on SUVs and pickups is what could happen if gasoline prices spike again. But Erich Merkle, Ford's chief U.S. sales analyst, said the booming popularity of SUVs is less a function of low gasoline prices than of how much the vehicles have improved and consumer needs have changed as baby boomers and their children get older. This report appeared on the website of Automotive News, a Detroit-based sister publication of Tire Business.